You are here: Home / News / News / Veedol’s New Synthetic pack become instant hit in Jordan. 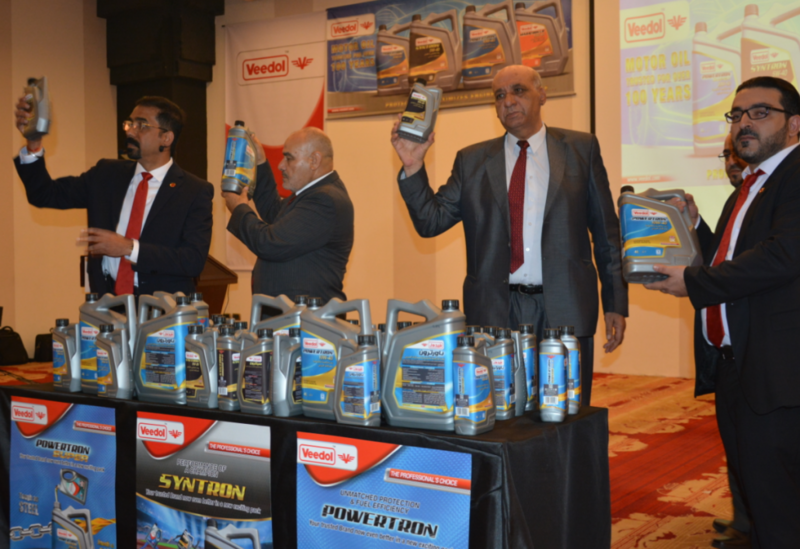 Veedol, the house of Firsts had created another landmark in the Middle East and Africa region by launching their latest packs for the synthetic range of engine oils. The company had just introduced these new pack, starting from Jordan. Veedol, The Professional’s choice in Motor Oil…For over a century had transformed the entire packaging of their synthetic grades, another first of its kind, after acquiring 100% ownership of a full-fledged plant in the U.K. With the acquisition of the plant, Veedol had an opportunity to introduce their unique bottles with a wrap-around label on it. Customers and channel partners were very excited with the ergonomically designed pack, it’s a wrap- around label that helps outstanding registration and visibility at the shop shelves. It was an instant hit. Response from the retail trade is extremely positive and their acceptance of the new pack should be seen as a booster by both the local partner and Veedol. The unveiling of the packs was held in Amman at crowded gathering of customers from across Jordan. It also turned out to be one of the best with record numbers of orders placed by the retail trade. Veedol intends to roll-out the new packs across Middle East and Africa during the second half of the year. http://veedol.ae/wp-content/uploads/2018/08/Jordan-Event-1.1.png 830 1210 CMD http://veedol.ae/wp-content/uploads/2017/08/logo_327.png CMD2018-08-08 05:55:162018-10-14 07:40:57Veedol’s New Synthetic pack become instant hit in Jordan.